Found 4 file extension associations related to Microsoft Flight Simulator 98 and 1 file format developed specifically for use with Microsoft Flight Simulator 98. The "1998" version of the popular Microsoft series. Flight Simulator is aimed at enthusiasts that features 3000 airports and precise recreations of 45 cityscapes. Flight modeling is provided by experts in both military and aerobatic fields. Helicopters and pre-launch planes are among those included. Many scenarios with full dialogue with the control tower adds a lot of realism to the game. Internet play enhances your flight experience with other human-controlled airplanes. 3D acceleration and MMX technology are supported. 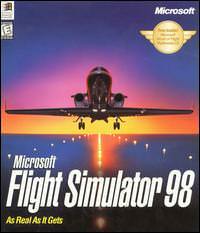 The Microsoft Flight Simulator 98 software seems to be old or discontinued. If you need more information please contact the developers of Microsoft Flight Simulator 98 (Microsoft Studios), or check out their product website.